“Poor Boy” degasser is most common name use in the oil field to describe mud gas separator. It is the purpose of design is to remove the gas that is mixed in with drilling fluid, often flammable, to make sure safety of the whole drilling rig. GN Solids America LLC’s GNZYQ1000A mud gas separator is designed with different capacities and meet specific mud gas separate needs. The least amount of harmful gas can manage by using vacuum degasser near the whole solids control system. However, the majority of gas that comes along the drilling fluid that is from underground during the kick situation, it needs GNZYQ 1000A mud gas separator to perform the task. GN Solids America’s GNZYQ 1000A is manufactured under standard of API and ISO. It has been widely used in oil rigs around the world and use by small companies to multi-national oil corporations around the world. GN Solids America’s mud gas separators are equipped with top quality, temperature and pressure sensor equipments where are needed. These instruments can provide accurate displays at the separator, a display at the choke and kill control system and give repeated signals for the drilling control system. GN Solids America, LLC can also custom made the mud gas separator to tailor the need of the specific oil rig. GNZYQ1000A Mud Gas Separator(Poor Boy Degasser) is a specific degassing equipment of drilling fluid with gas. GN Solids America’s Mud Gas Separator has a lot of advantages, including reliable safety, better treatment effect, long service life. Designed, manufactured and tested in accordance with API & ISO standards. We could see the mud gas separating installed in many drilling rig jobsite. Regarding to complicated geologic environment of drilling site, mud gas separator is used for separating the hazardous gas from the drilling fluids. Mud gas separator not only is used for oil & gas drilling site, but also it is applied for the deep mining drilling jobsite. How is GN mud gas separator working? Why we choose GN mud gas separator? 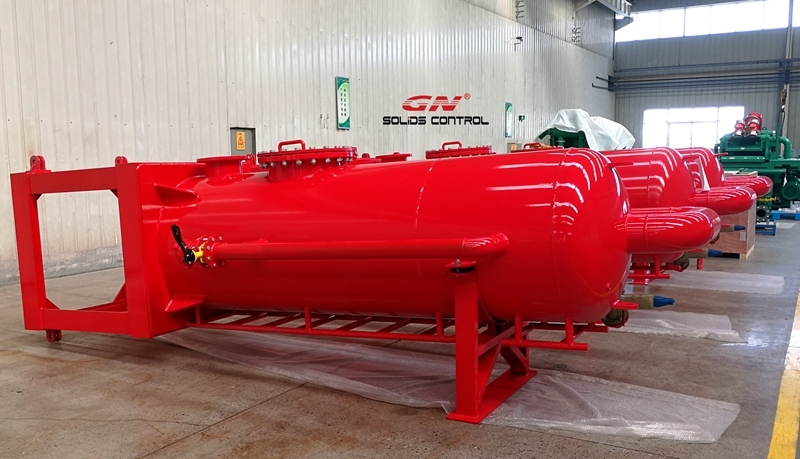 1.GN is recognized world-wide for accuracy, durability, from easy to complex and standard to cu stomize in order to design and manufacture the most reliable mud gas separator . 2. GN design, application, and manufacturing engineers have designed custom products to fit every single application. Such as, we could horizontally fold the mud gas separator on the skid for easy transportation. etc. We not only just provide you a single unit or system, but also focused on the best solution for your mud, fast response and convenient spare part delivery. Call us today to save your time and money.